The actual Flex light strip; tiny LEDs imbedded into a thin strip. Of all the gadgets and devices I’ve tried over the last couple of years, smart lighting has to be one of my personal favorites. 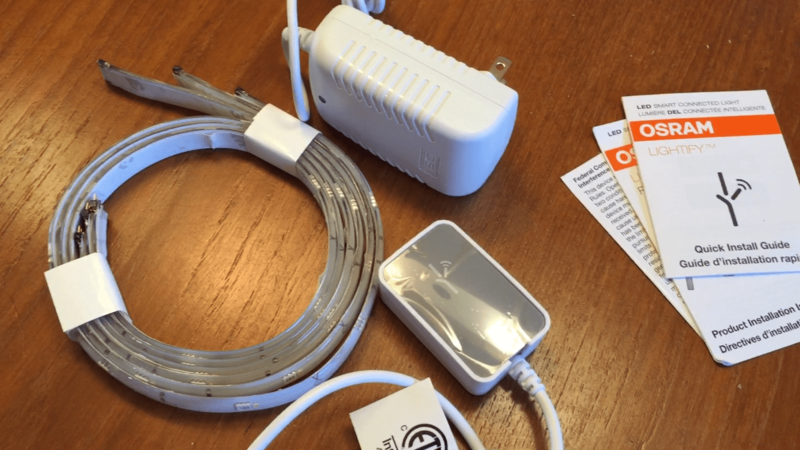 I was very excited when the newest member of the Osram Lightify family arrived for testing: it’s called the Osram Lightify Flex. In the pack there are 3 two- foot long strips of flexible LED Lighting, along with a power pack and a controller that helps hook up to your home’s Wi-Fi network. Each of the two foot-long LED lighting strips will connect to the other one, giving you a full 6 foot run of lights wherever you need them. I’m sure under counter lighting is going to be a hugely popular use for this product, but you could see getting really creative with it too: lighting around a mirror, a headboard, under a glass table top, or stone bar. There are endless possibilities because this lighting is ultra thin and completely bendable. Installation was quite easy. Though there’s one important caveat that you want to note before you leave the store. You need to have the Osram Gateway in order for your system to connect to Wi-Fi and your smart phone. The Gateway is sold separately for about $30. Setting up the kit and the Gateway was pretty easy. You snap the QR code on the back of the Gateway, which is essentially a very large AC plug. That takes you to an installation screen that helps you get the Gateway configured to your home’s Wi-Fi network. With that done, and an account set up, you’re ready to begin installing components from the Lightify line. The Osram Flex kit will also work with your existing WeMo home automation system too if you have one. That will also negate the need for a Gateway. 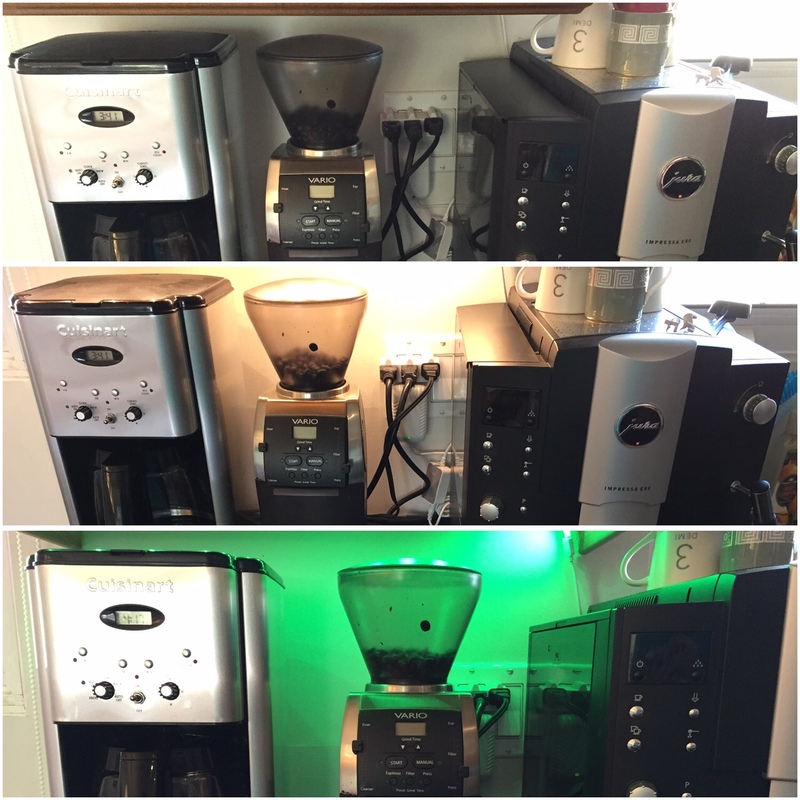 Coffee centre lighting: before, with warm light and with coloured light. Awesome sauce! With the Gateway (or WeMo) as your central hub installed, all that’s left to do is install the various lighting components themselves. That was as simple as peeling the adhesive backing from the flexible plastic strips of lighting, sticking them to the underside of the cabinet, then plugging that strip into the controller, and finally plugging that into the AC power supply. As soon as that last connection was made the light sparked up. I started with just one 2-foot strip over a coffee center in my kitchen. The lights are very bright, and even in daylight the brightening effect was noticeable and nice. Once the installation was complete, which took really 10 or 15 minutes, I was able to begin playing with the app. 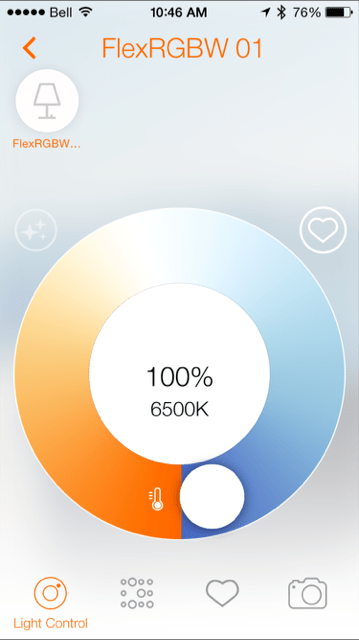 On it you can control color temperature (warm yellowish light for subtle warm lighting and relaxation, or cooler bluish late for work and tasks ), you can adjust brightness and dim the lighting strips from your smart phone, or you can change the color of the lights to pretty much any hue of the rainbow. The color aspect is one of the things I love the most about smart lighting. No longer do you solely need to rely on paint and fabric to bring a dose of color or brightness to your home. Now you can adjust lights for dinner parties, special occasions, holidays, and even your mood, or what kind of work you’re doing inside the home. It’s absolutely brilliant, and you shouldn’t underestimate the power of colored light in your home. Read more about Smart Lighting, like why the no-glass Nanoleaf is the world’s most energy efficient light bulb, or all about the WeMo home lighting and automation system. 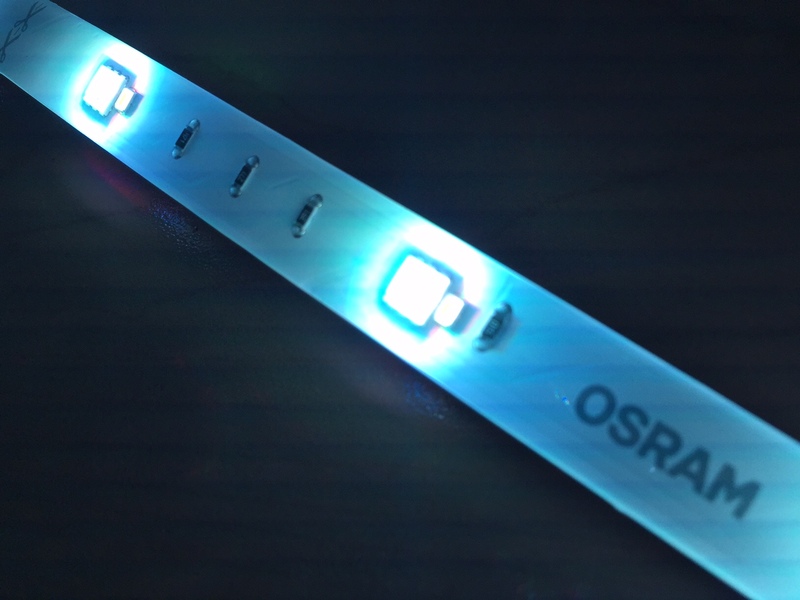 Using the Osram app to control the Flex smart light strips. Once I got comfortable fiddling with the controls, which are pretty easy to use, I also noticed there are a few basic settings within the app that allow you to do a quick-adjust at the touch of a button. There are really only three quick-choice options: warm, daylight, and a plant light option to help you grow. While the limited selection of presets is a bit disappointing, you can quite easily create your own, and save them to a quick touch menu. In fact, the Lightify had one of the easiest interfaces for setting up your own “favorites” that I’ve used in smart lighting recently, so I didn’t feel like I was missing having a bunch of presets within the app. There’s also a very easy to use timer setting that will turn your lights on and off when you need them. Since I’m frequently awake for my day job at 3 AM, there’s definitely something that juices my day when I wake up, when the lights are already on over the coffee center before I wake up, with a nice, warm, sunny, bright color temperature. I feel like it helps get me going. I found the Lightify App very easy to set up, and the Flex lighting kit very easy to install. I absolutely love how it looks in the kitchen, particularly the color options, and I really enjoy the timer settings. I’ve already been sharing this one with friends because I think it’s super versatile, fun, and very practical. It will definitely save you needing professional or semi professional installation of lighting in your home. Plus I’m already thinking of getting another kit to add elsewhere in the house. 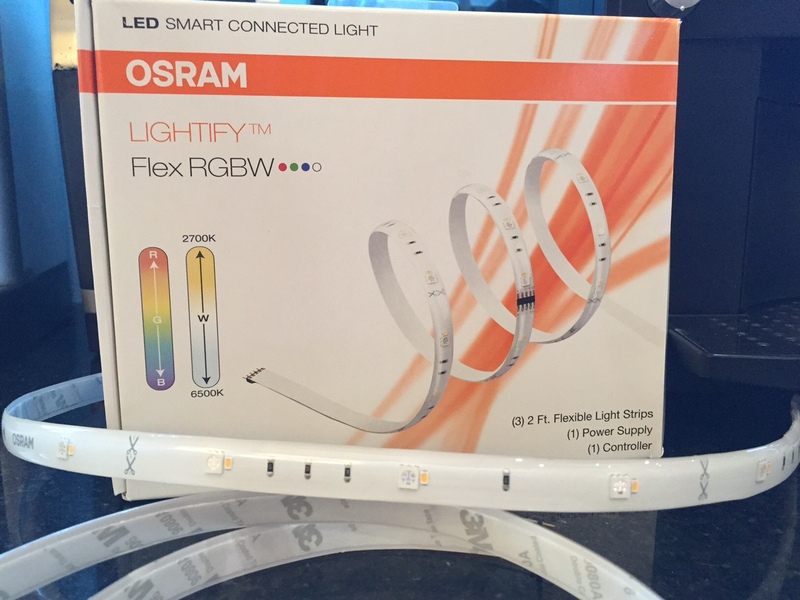 Get the Osram Lightify Flex kit from Best Buy. It’ll set you back about $149.